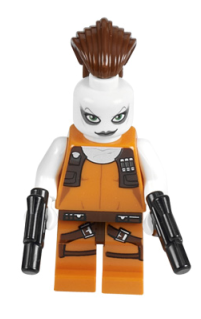 Aurra Sing is a Star Wars minifigure released in 2011 in 7930 Bounty Hunter Assault Gunship, and later in 2012 in 853421 LEGO® Star Wars™ Magnet Set: ARF Trooper, Aurra Sing and Embo. Aurra Sing is coloured white, instead of light nougat, as most licensed minfigures are. She has an exclusive hairpiece, which arches up and behind her torso. Her head is white, and the stud part of her head has no holes, (different from normal minfigures) like the rest of her body, and she has green eyes surrounded by grey circles. Her head is actually different from normal minifigures. She has a confident smile on her face, and has grey lips. Her torso is orange with a brown jacket over her shoulders with ammunition strapped in. On the back of her, she has the back of her jacket with a device for attaching her Sniper Rifle to. She has white arms and hands and is usually seen with a Sniper Rifle in addition to her two Blaster Pistols. Her hip joint is brown and resembles a belt strapped to her. Her legs are also orange, like her torso, and have two gun slings from her belt printed on them. In the Video Games, Aurra Sing has a Red-coloured Jumpsuit instead of an Orange Jumpsuit. The only differences being from the Orange Jumpsuit Variation is that her suit is red instead of orange and that instead of her green eyes inside a white circle, they are only pure green. Aurra Sing is usually seen with a Sniper Rifle in the game. Her abilites in the game include Sniper Shot, using her Sniper Rifle to zoom in on enemies and shoot them, and her Grappling Hook, which allows her to grapple on or up to marked places. Aurra Sing (also known as Nashtah) was a former Padawan, but following her being kidnapped by pirates, never knowing her father, a very uncaring mother and believing the Jedi abandoned her to take up the life of a bounty hunter, she left the Jedi Order and became a feared bounty hunter specializing in Jedi and political assassinations during the Clone Wars and beyond. This explains her deep connection with the Force her heightened senses. She was also known to work with other bounty hunters such as Cad Bane, Bossk and a young orphaned Boba Fett as well as his father Jango Fett before him, and once had a relationship with Hondo Ohnaka, as revealed in Star Wars: The Clone Wars. Aurra also makes a brief appearance in Star Wars Episode I: The Phantom Menace, watching the Boonta Eve Classic (Mos Espa Podrace) from a hill. On preliminary pictures, Aurra Sing was originally showed with Asajj Ventress's headpiece and no hair. This page was last edited on 27 May 2016, at 12:37.